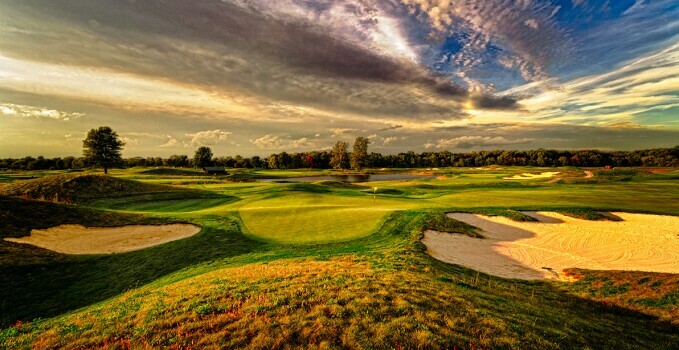 Athlon Sports compiled a list of the top golf holes in the country and the 6th hole at Purgatory Golf Club is their 6th hole on their 18 Holes to Play in 2015. The magazine is out on newsstands now. Named “Eunoe” after the river in Purgatory that causes a soul to remember their good deeds, the 6th hole is a par 4 measuring 434 yards from the back tees. The tee shot, shaped by three fairway bunkers inviting you into a fairly wide landing area, leaves a mid-iron approach shot to the green. The green has a Seth Raynor-style hogback that creates three separate tiers, challenging golfers to find the correct one. If a player challenges the back left pin position, then a bunker behind the green comes in to play and makes par almost impossible. The hole has the distinction of having the highest scoring average in relation to par during the last three Indiana major events played at the course.